Performing UPDATE or DELETE operation without a WHERE condition and losing data is the most common scenario seen with Users handling large SQL database. SQL is the most used database manager in corporate sectors for handling large data. At such level one small mistake can give a large impact on pocket so the user should always be prepared to handle such condition. And the best way is to always know the solution to recover deleted records in SQL Server. The preminent conceivable way to deal with accidental update and delete operation is to go for SQL database Backup. This solution can be implemented in different ways as discussed below. Restore the SQL Database Backup to be used as a replacement for original altered data. Go for UPDATE operation on altered rows and columns by finding the original data from backup. All the above mentioned scenarios can be used only if the updated SQL backup of the database is available. In most cases this solution fails because of below mentioned reason. If the alter database rows are not defined. Secondly, The fn_dblog function helps in reading SQL Server transaction logs and tracking the accidentally deleted or updated records, but unable to recover deleted records in SQL Server. 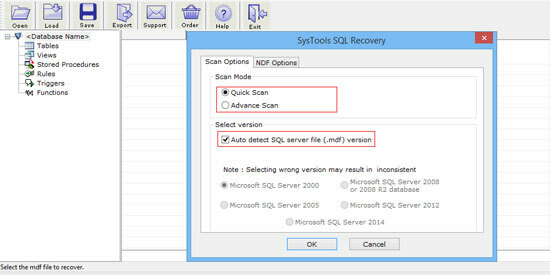 There is another solution for such situation which you can use if you don’t have recent backup of current database.SQL Recovery Utility can be used as an second alternative to recover deleted records in SQL Server. This alternative also allow to recover and save the database in desired location. Here we will discuss the procedure to recover SQL data from accidental delete or update operation using the SQL Recovery Utility. 2. Browse the database File to be recovered by clicking on OPEN. 3. Scan the File By choosing required scanning option. Quick Scan for normal corruption. 4. Choose the SQL Server version manually or go for auto detection. 5. Choose the option to recognize corresponding NDF file. 6. See the Summarized details of scanning operation provided by the Recovery Utility. 7. Save your .str file by selecting desired location. 8. Get a preview of recovered deleted or updated data. 11. Browse the location for saving exported file. 12. Click on Close after the Export has been completed. The blog discussed about the solution on how to recover deleted records in SQL Server Database if the backup of most recent database is not available for recovery. So, if you performed DELETE operation accidentally then you don’t need to worry about because you have its alternate recovery solution.